Combining stylish design with practical functionality, the BT Diverse 7460+ Twin is a dependable choice of cordless phones with answer machine for the home or office. 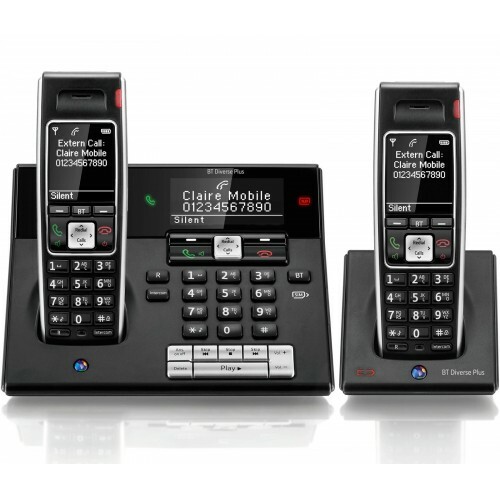 The base benefits from its own keypad, LCD display and loudspeaker so can be used to make and receive calls as well; and the sleek black handsets boast high contrast displays for a contemporary look and easier readability. There is a memory for up to 200 names and numbers to be stored on the Diverse 7460+, and contacts can be conveniently transferred to and from the cordless phone via an integrated sim card reader and writer. Copied entries are added to any existing contacts that have been stored, and you can accept or reject each entry until your phonebook is full. 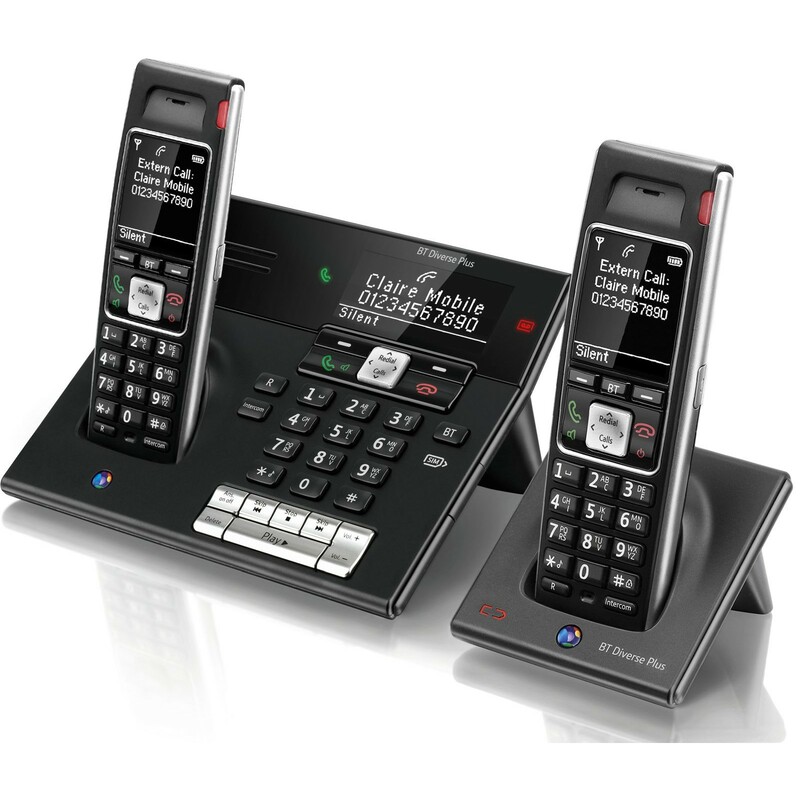 The multi-functional main base of the sleek BT Diverse 7460 Twin DECT Plus features a loudspeaker and full key pad to enable hands-free calls in excellent clarity without the use of a cordless handset. It also has an LCD display so that if subscribed to Caller ID, you will be able to see the name and number of any incoming calls; and also acts as indicator for new voicemail messages that have been recorded by the in-built digital answer machine. The answering machine benefits from a recording time of up to 27 minutes in total, and can be accessed conveniently from either of the cordless handsets, the base, and even remotely from an external line; in addition to providing features such as Call Screening. For talking comfortably in hands-free you can choose to take advantage of the loudspeaker when on a call, or alternatively connect a headset to one of the cordless handsets via the dedicated socket on the side. The Diverse 7460+ will work with a compatible BT DECT Repeater to extend the range of your cordless phones (and without a repeater will provide coverage for up to 50 metres indoors, 300 outdoors); and the battery life of the handsets affords you up to 12 hours continuous talk time and 120 hours on standby. All of which adds up to make the Diverse a dependable solution to your landline needs. Excellent product, exactly what it says on the box! Great service even though the product was out of stock you still managed delivery within the standard timescale!